A powerful and elegant mini portion snus with the classic General taste. Slightly peppery with hints of citrus zest and balanced tobacco notes. 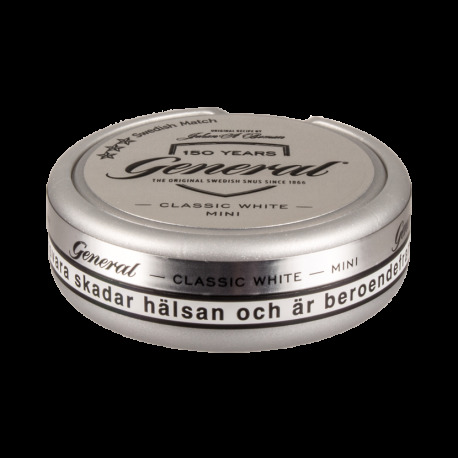 General Mini White Portion Snus is powerful and elegant mini portion snus with the classic General taste. Slightly peppery with hints of citrus zest and balanced tobacco notes. This is a white portion snus meaning it does not go through an additional wetting process during manufacture. This makes the pouch drier to the touch and gives it a whitish color, hence the name white portion. The flavor of white portions tend to come on slower but remain flavorful longer than their original portion brothers. These are scaled down mini pouches of snus in a tiny plastic can. I have been scaling down my snus usage from ultra strong varieties down to normal strength and now these portions. The pkan was to always just quit smoking. I haven't smoked in more than two years. Frankly, I don't trust that quality snus will always be available in the US and feel like maybe now is the time to bow out. Snus has been a wonderful product. I was that smoker that would never quit, period. But cigarettes changed into the proof of concept FSC cancer stick that they were not when I started in 2002 and I got sick of it and made the switch, eventually, stemming from General's insurgency into the US scene around 2012-ish. I always felt that their products were fantastic and I owed them my loyalty. Probably my life for helping me quit smoking. As for this product. I found the transition from "Strong" to "Regular" portions the worst one. If you are hesitant to try these out thinking they will not be strong enough, fear not - they work as well as the bigger portions. They present a couple of advantages. When I sneeze they don't fly across the room. I can feel them far less and they provide enough nicotine but I'm convinced that at this point I'm ingesting so little that once I get down to five cans and start alternating 2 hours with a snus, 2 hours without that it will only be a slight withdrawl. These have that signature General White taste that I will miss and will cherish these next few weeks. When I purchased this I thought it was slim white. Never thought General would market something like this. Secondly its mislabeled. it should be labeled as strong. Same nicotine in a small package. Unlike regular snus it hits fast hard and does not last. 20 mins later you want more. This has been the only time I have ever been dissapointed in a snus central purchase. I feel ripped off. I doubt I will use another general product after this. fool me once... Never twice. Not crazy about the size of the pouches. The flavour is exactly the same as the regular sized General White. However, what is nice about it is the container which is significantly smaller than the usual can of snus. I always found it cumbersome to walk around with the regular sized can in my pocket, it is just too large. But the mini can is perfect. I now use it for transporting the snus I am using that day. You can put at least five regular sized snus pouches in it. So I recommend purchasing it if you are looking for a convenient sized container for snus...and it still has the part at the top for discarding used snus.